Hum TV is reputable for its Finite Dramas in which popular Pakistani actors portray the lead roles. Besides having a great cast, the stories for these serials are written by famous Pakistani writers who come up with great concepts. Most of these dramas feature concepts like family values, love, spirituality etc. Being a finite series, every serial runs for a limited amount of time which is one of the factors adding to the popularity of these serials. Hum TV became the number one in a very short time because of its Dramas which gained international attention. The serials which are in the Urdu language are understandable to any Hindi and Urdu speaking audience. These serials have also been aired by TV Channels like Rishtey TV, Zindagi Channel etc., and gained huge popularity in the UK, Europe etc. The Dramas have also won countless awards. Some of the best TV shows featuring on Hum Television channel are Khamoshi, Naseebon Jali, Gumraah, Neelam Kinarey, Pagli, Mein Maa Nahin Banna Chahti, etc. The channel also features a show called Jago Pakistan Jago. Hum TV also organizes prestigious events like Award Functions, Fashion shows etc. The channel’s award functions are well regarded in the region and popular among the world societies. Hum Network has 2 different channels under its wings- Hum Sitarey and Hum Masala. Of these Hum Sitarey is an entertainment channel featuring different Romantic and Drama filled serials, Game shows, Behind the Scenes programs, comedy programs etc. The channel is quite popular in Pakistan for its shows and serials like Babul Ki Sahaliyan, Dooriyan, Miss U Kabhi Kabhi, Shaher e Tamana, ZigZag. Hum Masala is a food channel broadcasting food programs in the Urdu language. This channel is also popular among the Urdu speaking audience around the world delivering them the best Pakistani as well as international Recipes all the time. The channel features different shows like Flame On Hai, Chaska Pakanay Ka, Evening with Shireen, Food Diaries, Lively Weekends, Mehboob’s Kitchen, etc. 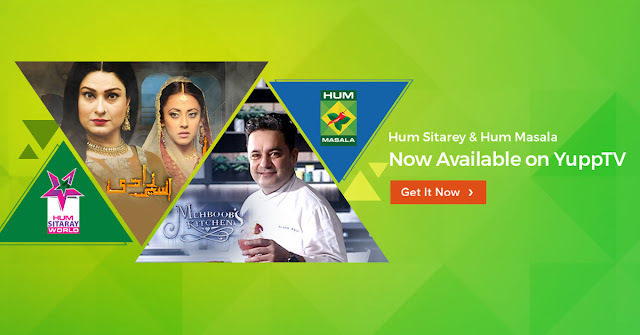 Hum TV, Hum Sitarey and Hum Masala- Pakistan’s most popular and world’s top Urdu channels are now available to watch all over the world (except the USA) through YuppTV. Check out some of the best and highly popular Urdu shows in the world.